When you stay in Wales, visit our lovely Welsh farmhouse Bed and Breakfast and Nook Cottage, which is ideal for a couple, for a wonderful and unique Pembrokeshire holiday or short break. We provide a wide selection of cooked and uncooked breakfasts with often locally sourced produce, (the eggs are from our chickens!) and homemade bread and cakes. We have many beautiful beaches a few miles away and the Pembrokeshire Coastal Path. We are not too far from the departure point for Skomer Island where the puffins breed in spring and early summer. There are many outdoor attractions for the wildlife and countryside enthusiasts, such as coastal walking, bird watching, sailing, fishing and golf. Rosehill farm is close to historic towns; Haverfordwest, Milford Haven and Neyland and their Marinas and Pembroke and its Castle. 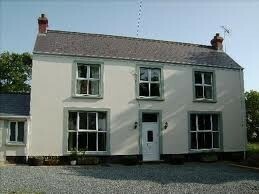 My Bed and Breakfast is centrally located for easy access to North and South Pembrokshire. For history visit St David's Cathedral or Tenby, both only about 25 mins drive away. The Brunel Cycle Path is down the road for off road cycling to Neyland Marina or Haverfordwest or you could walk long the R. Cleddau and watch the waterfowl.